1. What are some blogs that you like the look of? What specifically do you like about them? It's never cool to flat out copy someone, but using someone else's design as inspiration can be a good way to get the final look you want. Do you like their color scheme? Their header? The way they organized their sidebars? Try to be specific about what you like or dislike. Write it down. 2. What colors do you want to use? From Design Seeds. Also, give Color Collective a try. These websites are great for finding color inspiration (I know there are others but I don't have the URLs saved anywhere. If you have them, please share them in the comments!). There are no hard and fast rules when it comes to this kind of thing but, when it doubt, pick one dominant color and a couple accent colors. Also, don't be afraid of white space. It's clean looking! Go back to those blogs you like- how do they use color? In large splashes? As backgrounds? Small amounts? 3. What fonts do you want to use? Fonts come in a million shapes, sizes and price ranges. The internet is full of free fonts so I have yet to buy one, but that is an option. There are bouncy fonts, scripty fonts, angular fonts, bubble fonts, vintagey fonts..anything you could ever want. If you're not a design-y type and haven't spent much time around fonts, I suggest this Beginner's Guide to Pairing Fonts. Then pick a font or two or even three. You'll probably want to keep your page font as Arial, Helvetica or Times New Roman for the sake of easy reading, but you've got all kinds of options when it comes to your header, subtitles, navigation, etc. Google "Free fonts" (or search on Pinterest) to find an overwhelming number of options. 4. Do you want to use any patterns in your design? In my experience, patterns aren't a popular way to go, but I love working with them. They can add a lot to an otherwise dull blog design. If you feel like there's something missing, perhaps try a pattern? And now I'll share my secret pattern weapon with you-- Colour Lovers. Pick a pattern, fill it with colors from your chosen palette, then add it to your design. So ridiculously easy. Alternatively, you can always use a photo as your background image (like I currently have going on). Make sure you have the right to use the image though (mine was taken by Aaron at our fav hiking spot). When you put it all together, does it look cohesive? Does it have the general feeling you're looking for? Inspiration boards are a good way to make sure everything meshes and you've hit on a good tone, but don't marry yourself to it. 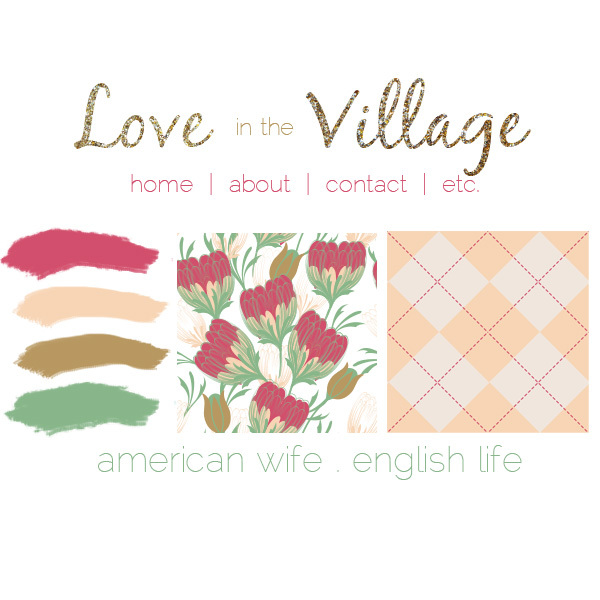 For Love in the Village I ended up doing something completely different for her navigation bar. I did another design where I built out part of the template and then realized the fonts we had initially settled on were too clunky. Use your inspiration board as a jumping off point then look for things that might need to be tweaked as you start building everything and putting it together. fascinating - great tips! i'm going to check out colour lovers. I looooove Adrienne's blog -- incredible. and you know I have crazy blog background envy with your photo. Very cool blog. Being able to pull color schemes out of a photo is genius. I'm totally going to use that. As for the fonts, I like fontsquirrel.com. You can see which fonts are popular and even see them broken down by their type. People don't realize how much of a difference font can make until you go outside the standard included stuff. Awesome! I hadn't heard of Fontsquirrel.com. Thanks for sharing! This is so helpful! Love it!